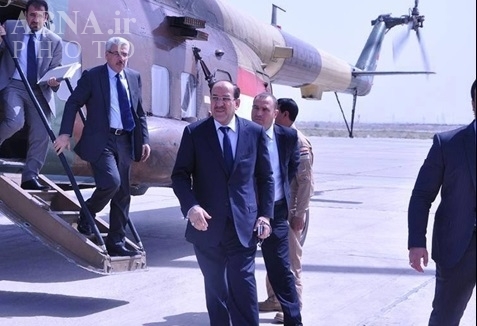 JNN 07 Sept 2014 Baghdad : Iraq’s outgoing Prime Minister Nouri al-Maliki paid an unexpected visit to the town of Amerli on Monday, following its liberation from the Islamic State Terrorists over the weekend, and warned in televised remarks that “Iraq will be a graveyard for ISIL Terrorists” . Hours before Maliki’s arrival, multiple air-drops and truckloads of humanitarian supplies had begun to pour much-needed resources back into Amerli following a two month-long siege. On Monday, four trucks filled with food and medicine dispatched by the Iraqi government and Iraqi Red Crescent arrived into the town where 15,000 Shiite Turkmen had been stranded for weeks with little or no running water and electricity, according to a local NGO official. Iraqi security forces backed by Shiite militia and Kurdish fighters say they reclaimed the northern farming town around mid-day Sunday from Islamic State fighters, after an operation that began at dawn. US airstrikes on Wahabi Terrorists positions over the weekend assisted the Iraqi forces in breaking the siege. Australian, French, British, and American planes also provided aid drops over the weekend to relieve residents who had entrenched themselves in the town, located roughly 100 miles north of Baghdad, since June when the IS began its widespread assault across northern and western Iraq. Instead of fleeing the Wahabi Terrorists attack , the Brave Shiite Turkmen residents of Amerli chose to stay and fight, managing at first to successfully defend the town against initial attacks. They then became trapped behind their makeshift trenches and fortified posts as militants encircled the town. Iraqi security forces have struggled against the growing insurgency waged by the Islamic State, which has seized large swathes of land in recent weeks, including the key strategic cities of Mosul and Tikrit. The amy’s success in Amerli is a “big achievement and an important victory,” Army spokesman Lieutenant General Qassim al-Moussawi said on state TV Sunday. The US has been launching limited airstrikes against Islamic State positions using military craft and unmanned drones since early August. At least 120 US airstrikes have been carried out so far, mostly in support of Kurdish fighters who are battling the Islamic State militants in the north, and to support trapped members of the Izadi community, a Kurdish ethno-religious minority, in the northwestern region of Mount Sinjar. Thousands have died as a result of the Islamic State’s increasingly violent campaign in recent months. At least 1,420 Iraqis were killed in August alone, according to figures released by the UN on Monday. This entry was posted in Middle East and tagged Amerli, Iraq, Iraqi security forces, ISIL, ISIS, Islamic State, Islamic State Terrorists, prime minister nouri al maliki. Bookmark the permalink.